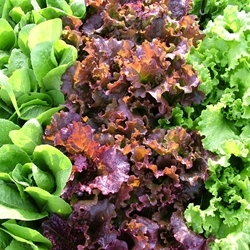 Lettuce is hardy and can be planted as soon as the soil can be worked. It is typically a cool season crop and grows best when the temperatures are in the 60's. Lettuce may regrow after it is harvested but may become bitter if the temperatures are too warm. Available in a four pack. All plants are certified organic. Select here for transplant information, pick up and order dates.